Of the countless billions served - html pages from far, far away - out there, each of us gets a chance to see but a few. What's been taking up perhaps just a little too much of my time of late is stumbling upon a few of those liked by others using StumbleUpon. Heralded by some as the greatest tool on the web after Google itself, I'm not sure I'd go that far, but it's pretty good. You click "I like it!" on a page you come across and from the vast primordial electronic sludge of insignificance, that site is pushed forth into it's newfound existence, stumbling all the way, it's struggle for the screen and to face the threat of virtual extinction once again at the hands of the dreaded "Not-for-me". But isn't that the way with all things? 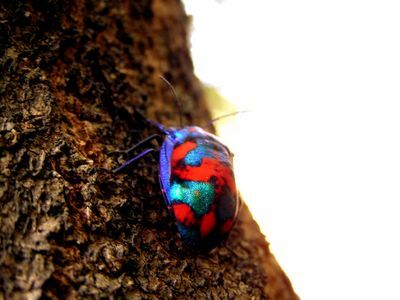 Colourful bug, stumbled upon while climbing the mango tree. Like it? Hey, thanks, I stumbled across your page in google, that software is really cool. And the picture of the bug is great quality too.